The kids and I headed out to the Puyallup Fair Friday afternoon with a family friend. I planned our day around many of the educational activities that support our learning plan. Therefore, most of the time we spent at the fair can be counted towards our required hours for CVA. I love it when learning is fun and the kids enjoy themselves. The first thing we did was locate our favorite caricature artist, Tom Huf. Scott and I first had him draw us when I was pregnant with Mika. After drawing your face(s), he asks you what you want to be doing in the picture. We asked him to draw me looking pregnant and Scott touching my belly. He did and it looked great. We returned the next year and every year since. This year was our ninth year. This stop fits our social studies goal of "learning about traditional and nontraditional careers." Shortly after that, we found the new Animals of the World exhibit which proved to be perfect for our science studies (land animals) and really interesting. I made the college of some of the photos I took of those animals for ya'll. The llama looked so proud sitting so straight and upright. The Watusi cattle's horns were HUGE! The Jacob's sheep looked almost demonic with their four horns sticking our of their heads at all angles. The baby Nigerian pygmy goats were so very cute (and we even got to pet one). 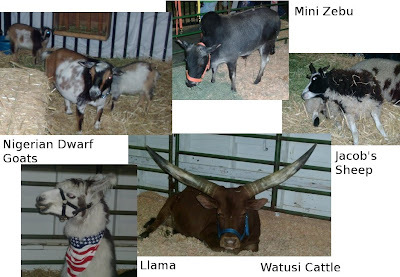 The mini zebu was just plain odd but very social. We also saw a camel, an alpaca, a longhorn steer (HUGE horns again), American heritage turkeys, and other animals. It was a great experience seeing these animals that we'd probably not ever see otherwise. We also got to see a zebra and a ze-donk. We learned that a ze-donk is what you get when you cross a zebra with a mini donkey. The ze-donk is the one in the foreground. They also go by the terms zebroid, zebrass, and zonkey. Other interesting zebra hybrids are the zorse (offspring of a zebra stallion and horse mare) and the hebra (offspring of a zebra mare and horse stallion). Wikipedia provides some interesting information about zebra hybrids as does this website. Walking around, we came upon a tractor dealer. The kids enjoyed climbing up into the seat of the tractor. Mika chose the largest tractor they had to climb into and Sammy found the tractor's horn. While waiting for the older kids to ride a couple of rides (Josh was too young), I found a nearby vendor that had a bubble maker going to entertain Josh with. He loves bubbles. I caught this funny expression of Josh ax kicking the bubbles with a nice strong kiyop (Korean for yell). He learned to kick and kiyop by watching Sammy's taekwondo classes. I think he'll be ready for taekwondo classes early; he certainly has the spirit aspect down. Speaking of bubbles. Isn't this the coolest picture? When I looked up and saw all these bubbles against the background of the clouds, I just had to try to get a good photo. We found one ride that would let Josh on. Josh wasn't sure what to think about the canoe ride but he seemed to enjoy it. What he really wanted was to be allowed into the obstacle course that ends with a ball pit thingy and onto the carousel. Sammy wanted to go on the Ferris wheel. Mika agreed to be brave and try it out too. I didn't want them going on it alone, especially because Mika tends to be easily frightened of rides. Besides, she wouldn't go on it without me anyway. So, I bought the extra tickets and took them up. We even called Daddy from the top of the Ferris wheel. Both kids, who've never been on the Ferris wheel, ended up loving it and have declared it their new favorite fair ride. We were heading towards the fine arts exhibits when we came across these guys. Not only do they sound really cool but they are a lot of fun to watch. How many people can say they beat on water bottles and stools for a living? After the drummers, we headed to the fine arts exhibit hall and spent some time looking at the quilts (well, I did at least). We spent some time watching and talking with Tim Jensen, an extremely talented artist who uses pencil and pastels. After that, we grabbed ballots and looked through the art to vote for our favorites for people's choice. Then we walked through the photography. Josh conveniently fell asleep and slept through all of this and got lots of "Aw, how cute" or "Aw, how sweet" comments. From the photography, we headed to another nearby building to pick up a McCain/Palin button we saw several people wearing. In that building, we found a beekeeper's association table and checked out the bee hives they have available. The kids even found the queen. Following that building, we headed for the exit to come home but got sidetracked by Roberto the Magnificent. He's a great juggler and funny actor. It makes for a great show. The kids asked to stay and watch so we did. We ended our fair trip with this lovely photo by the fountain. Notice the fire department tattoo on his right arm, the police department tattoo on the left arm, the McCain button (he wanted to wear it), and his ever so attractive eyes.